Carlo joined Scotus in April 1971, he progressed in the Primary school and participated in all activities and enjoyed life. While in Primary 6 he became very ill and underwent a major operation. 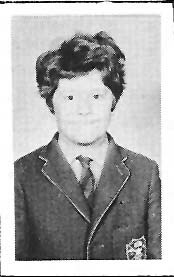 All seemed well and after reccuperation he returned to school and re-joined his class, now P7, in Sept' 1974. However Carlo was not to enjoy good health and returned to hospital where he died on the 7th December 1974.